Coinciding with this year's World Glaucoma Week, the Ophthalmic Department at Beaumont Hospital has launched an innovative nurse-led glaucoma clinic designed to shorten waiting times and speed up diagnosis. Based on an approach currently proving successful in the UK, the new Irish clinic involves a Clinical Nurse Specialist reviewing stable glaucoma patients and glaucoma suspects under specific clinical guidelines. While nurse-led, the clinic is fully supported by senior opthalmic clinicians and is believed to be the first "combined shared" clinic of this type in an Irish hospital. This clinic, which is subject to ongoing audit, has been made possible by the funding of the Clinical Nurse Specialist post by pharmaceutical company MSD. There are some 9 million glaucoma patients in Europe and In Ireland one in 10 people over 50 and one in 200 under 50 are at risk of developing the disease, which has no obvious early symptoms. Glaucoma is the second commonest cause of blind registration in Ireland. Patients with glaucoma related pathologies account for about a quarter of all attendances at eye clinics. Beaumont's Ophthalmic Department sees over 7,000 patients at its outpatient clinics each year. While this number has increased steadily over recent years, most recently capacity constraints and the growing demands of an ageing population have resulted in increasing delays for new patients. Improved levels of detection are also contributing to the increase in demand. Consultant Opthalmologist Mr Tim Fulcher says that the new shared clinic is already having a positive effect on this situation. He expects that over coming months it will remove a significant number of patients from the general eye clinics, thereby shortening waiting times for all new patients, especially glaucoma suspects. Once glaucoma has been diagnosed a patient will require life-long care thereafter. The good news, however, is that earlier diagnosis and the much improved treatments developed over recent years mean a reduction in the proportion of patients who will go on to suffer sight loss. World Glaucoma Week runs from March 6th to 12th and aims to raise awareness of this leading cause of blindness. Glaucoma refers to a group of diseases which affect the eye's ability to maintin its normal internal pressure. This can damage peripheral vision and, if untreated, cause total blindness. 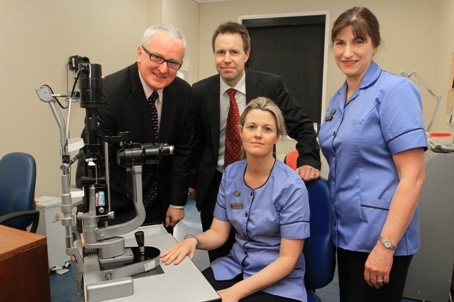 Tim Fulcher, Consultant Opthalmologist and Clinical Nurse Specialists Helen Hobbs and Aishling McCourt (seated).